The US and India have finalised a controversial nuclear deal after talks in Delhi between President George W Bush and Indian PM Manmohan Singh. Energy-hungry India will get access to US civil nuclear technology and open its nuclear facilities to inspection. 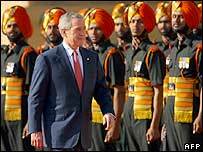 Mr Bush, on his first visit to India, called the deal "historic". But he said it might be hard to get it through the US Congress, which must ratify it. India has not signed the Nuclear Non-Proliferation Treaty (NPT). The BBC's Sanjoy Majumder in Delhi says the nuclear deal will end years of international isolation for India over its nuclear policy. But critics say it sends the wrong message to countries like Iran, whose nuclear ambitions Washington opposes. 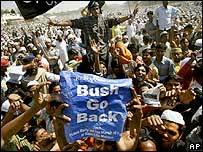 Communist parties and Muslim groups are opposed to the visit and are leading protests across India, but Mr Bush is being welcomed by many other Indians. Speaking at a news conference after the talks, President Bush said: "It's a necessary agreement. It's one that will help both our peoples. "Congress has got to understand that it's in our economic interests that India have a civilian nuclear power industry to help take the pressure off the global demand for energy." Mr Bush pledged that his visit to Pakistan later in the week would go ahead, despite a bomb blast that killed a US diplomat and at least three others near the US consulate in Karachi on Thursday. And he said "the US is looking forward to eating Indian mangoes", under an agreement to expand trade in farm products. Mr Singh said India had finalised a plan to separate its military and civilian nuclear facilities, a move contingent on the deal going through. "We have made history today," he said, praising Mr Bush's personal efforts to secure the accord. Under the agreement, India will classify 14 of its 22 nuclear facilities as being for civilian use, and thus open to inspection. China was swift to stress that nuclear co-operation between India and the US "must conform with provisions of the international non-proliferation regime". The director of the International Atomic Energy Agency (IAEA), Mohamed ElBaradei, welcomed the deal, calling India "an important partner in the non-proliferation regime". France, which signed a similar deal of its own with India last month, said the accord would help fight climate change and non-proliferation efforts. Those opposed to the deal, in the US Congress and elsewhere, disagree. Many supporters of the NPT believe the deal ignores India's nuclear weapons programme. In India, too, critics have alleged that the country's tradition of non-alignment is being eroded as it forges closer ties with the US. India's traditional rival, Pakistan, indicated that it wanted a similar agreement. "Pakistan believes that we also have a claim, an expectation for international cooperation under safeguards for nuclear power generation," Pakistani foreign ministry spokeswoman Tasnim Aslam said. Earlier, Mr Bush inspected a ceremonial guard of honour at the imposing colonial-era presidential palace in the heart of Delhi. He followed that by a wreath-laying ceremony at Raj Ghat, the memorial to Mahatma Gandhi, before his talks with Mr Singh. Observers say the visit shows a growing bond between the two leaders. There is a heavy security presence in Delhi, with armed policemen on the streets leading to the venue of the summit. Helicopters hovered overhead as the presidential motorcade moved across the city, accompanied by motorcycle outriders. A session of the Indian parliament was adjourned after left-wing MPs organised a sit-in in protest against President Bush's visit. About 30,000 people protested against his trip in Calcutta, while several thousand rallied in Delhi, far fewer than had marched on Wednesday. During his trip, President Bush will also visit the southern city of Hyderabad, one of India's high-technology hubs, where there have also been protests. Bush must convince critics of the benefits of the nuclear deal with India. What is success for US and India?